The recommended times to wash linens, blankets, and other bedding depends primarily on use and how close the materials are to your body when you sleep. Sheets, pillows, and duvet covers are in direct contact with your skin every night, so they're a lot like the clothes you wear during the day—and should be washed almost as frequently. Blankets and comforters may have very little contact with your skin and therefore can be washed less often. 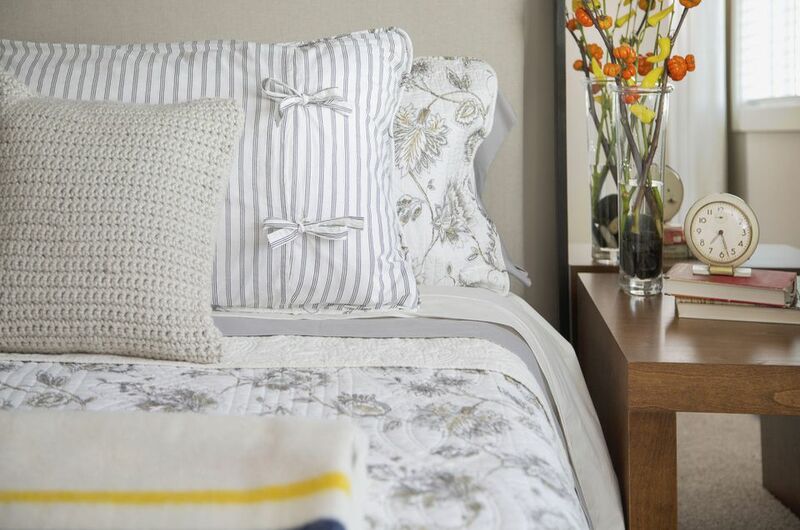 Health and hospitality experts recommend washing sheets and pillowcases at least once a week. Sheets get oils and dirt on them from our bodies and can lead to tough stains. Sheets also collect anything that comes off of our bodies, particularly dead skin but also bacteria and pathogens. Dust mites feed on dead skin, and the feces from these microscopic insects can worsen symptoms from allergy sufferers. Be sure to check for and treat any stains on your sheets no matter how often you wash them. Also, avoid washing sheets in hot water because it can shrink your sheets, which you might not notice until you try to put them back on the bed. Warm water is much more likely to get them clean without shrinkage. If you use pillow protectors on your pillows and under your pillow cases, you probably only need to wash your pillows three times a year. However, the pillow protectors should be unzipped and washed monthly. Oils and dirt from our hair and faces soak into the pillows and can even soak into the filling of a pillow. Washing pillow protectors monthly with a mild laundry detergent will keep them clean and fresh. If you don't use pillow protectors, washing your pillows monthly or at least every other month will be your best bet. Most washing machines can handle washing a pair of pillows at a time. It's not a good idea to wash a single pillow because it throws your machine out of balance. To decide how often to wash extra blankets, you need to figure out how often they are actually used. If you have blankets at the end of your bed that are seldom unrolled and used, then washing them every few months should work well. However, if a blanket is used daily or nightly, you may want to put it on a weekly or biweekly washing schedule. Be sure to follow the specific care instructions for your blankets, and wash them as directed. If a blanket is used less often, be careful about color bleeding color when you do wash it (if it isn't colorfast.) You can always wash a blanket in a load by itself if you have any concerns. Covers for comforters and duvets help protect the interior from most everyday dirt and soiling. Unless the comforter has something spilled on it, you won't need to wash it more than once or twice a year. The cover, however, will need to be washed weekly. If you consistently use a top sheet, you might be able to stretch this and wash your comforter every two to four weeks. On the other hand, if there is no separate cover, you'll need to wash the entire comforter every week and whenever spills or stains occur. If your machine can't handle the size, you may need to launder your comforter at a laundromat where there are oversize machines for bedding. Using a mattress cover is a lifesaver in extending the life of your mattress. Mattress covers can help prevent mattress damage, reduce allergy symptoms, and keep your mattress clean and comfy. Mattress covers themselves should be removed and washed at least monthly. If any spills or stains occur, remove the cover, treat it, and wash it according to the directions as soon as possible. All those extra bedroom pieces are usually for decoration and not function. Items like bed skirts, canopies, and curtains don't usually get dirty very often. However, if you are an allergy sufferer, you may want to wash these items every two to three months. For everyone else, twice a year or yearly washings usually are all that are needed unless spills or stains occur. Be sure to follow directions to avoid damaging the fabric and to prevent colors from fading. How Often Should We Dust?